Creating a nice expensive motorcycle is almost easy – just throw the best technology at it and charge wealthy owners accordingly. Much more vexing is how to design and build a stylish and entertaining streetbike at a low price. It’s difficult to imagine anyone doing a better job of that value equation than KTM, which recently had its 390 Duke returned after enduring several months of being passed around to neglectful MO editors who ruthlessly tried to twist the nuts of this eager funster. Despite being forced to ride every new motorcycle on the planet (a regular part of our jobs) we were able to amass nearly 2,000 miles on the littlest Duke, and it fully legitimized itself as the rightful owner of our Best Lightweight/Entry-Level MOBO award of 2015. In fact, considering its surprisingly low $4,999 MSRP, the 390 Duke also makes a great case for itself as a winner in our Value category. Check out that number again. For just $5k, the KTM is equipped with desirable features like a robotically welded tubular-trellis frame, aluminum swingarm, tapered aluminum handlebar, stout 43mm inverted fork, radial-mount front brakes, braided-steel lines and grippy Pirelli tires – nice stuff not available on its rivals. Oh, and that price includes ABS, a highly attractive feature for a bike catering in large part to junior-level riders – and one that’s optional or not yet available on its competitors. Few would guess this attractive street machine retails for less than $5,000. The windscreen seen in this photo is from KTM’s PowerParts division, which replaced the teeny little stock deflector to provide a modicum of wind protection for $40. Despite the shockingly low price, KTM hasn’t been able to rewrite the rules of economics. Production costs have been reduced by building the smallest Dukes (125 and 200cc versions in other markets since 2011-12) in India at Bajaj, a 49% stakeholder in KTM. This is the new state of play in the moto industry, as the Japanese Big Four builds its price-point models at factories in Thailand, Indonesia and China. Heck, even lauded Euro OEMs Ducati and Triumph build bikes in Thailand. But back to what’s made the 390 Duke a star player in the lightweight category. It’s faster than most of its rivals, and if it isn’t, it’s a better handler. Yep, the Duke’s 373cc single-cylinder mill is either punchier or smoother or both than any sub-400cc street engine. It has considerably more torque than its 300cc rivals, and it kicks out a relatively robust 40 horses to its rear Pirelli, which is enough to spin its speedo up to 110 mph or so if given enough room. 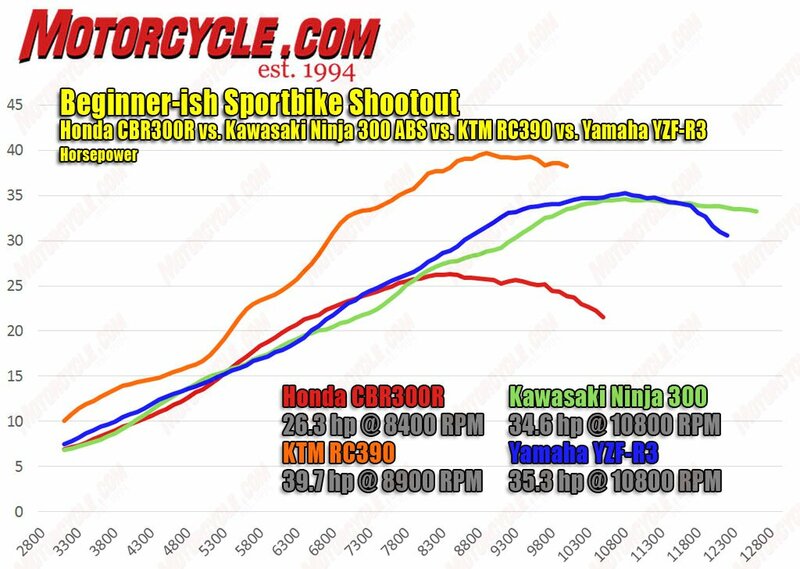 The Duke 390 motor is identical to its RC390 KTM brother, and this chart shows how it cranks out more power sooner and bigger than its competitors. While the 390’s motor received universal praise, its front brake setup was the subject of derision. The made-in-India ByBre brakes deliver wooden feedback via its stock pads, not measuring up to the implied promise of the radial-mount caliper design from Brembo and steel lines. However, a major step up in performance can be had by a simple brake-pad swap. We were more than pleased by the improvement offered by the SBS 877RS pads we installed – an enhancement of feel and power easily worth twice the cost of the $45 pads. Another sore spot – literally – was the stock seat, which isn’t especially compliant and uses a plasticky cover. KTM”s PowerParts catalog provided relief in the form of the Ergo Seat, which uses much nicer material for its cover and plusher, thicker foam. It’s vastly more comfortable than the stocker and remained so even after nearly 200 miles in the saddle when I rode it out to Chuckwalla Valley Raceway for a trackday. 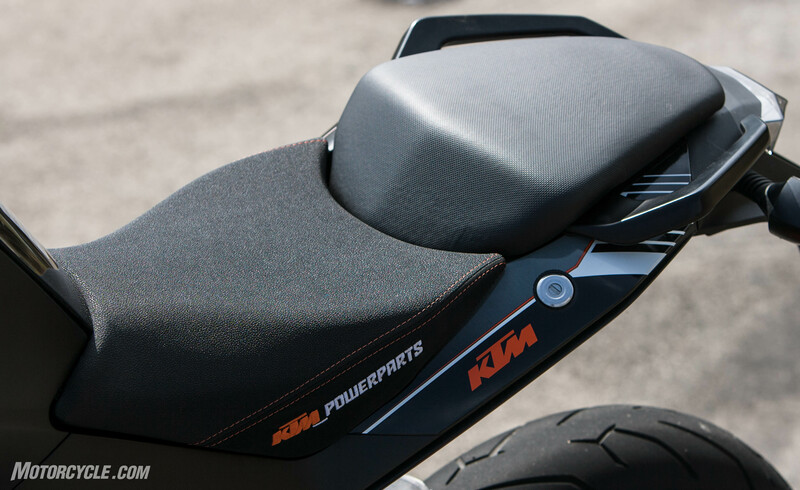 KTM’s Ergo Seat uses much nicer materials (note its softer textured surface next to the plasticky pillion saddle) and is well worth its $130 price as long as your legs aren’t especially short. Although I had a riotously good time piloting the 390 around Chuckwalla, its preferred playground is on the street and in the canyons. The bike’s extreme light weight makes easy for any person to manhandle, and its upright riding position is preferable and more versatile to sportier riding positions like fully faired little sportbikes, giving a rider an advantageous helm to maneuver through traffic or dissect canyon roads. 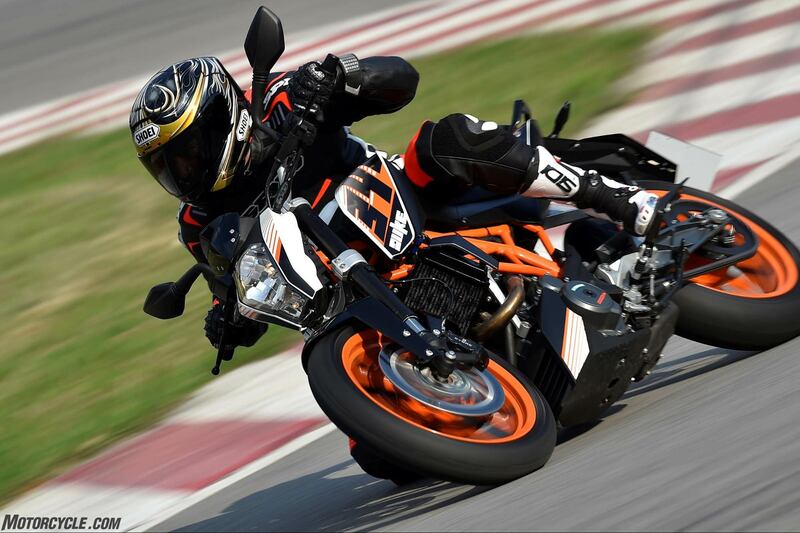 Indeed, for a $5k package, the 390 Duke can’t be topped in terms of versatility, style and performance. Most sub-400cc bikes feel weak in the lower part of their rev ranges, but the 390 Duke’s bounty of low-rpm torque means that its rider isn’t always hunting for the meat of the engine’s powerband. The Duke even held its head high when compared to Honda’s excellent CB500F, a bike that costs $1,300 extra when equipped with ABS brakes. Flaws are minor and mostly easily rectified. Handlebar grips are hard and feel cheap, but a swap to nice aftermarket grips would be inexpensive and simple. Instrumentation is fairly comprehensive for a machine in this class, but larger readouts on a few of its displays would be helpful. Lastly, we weren’t impressed by the sometimes-balky gearbox, which seems a bit crude relative to other bikes in the class. On the plus side, its slipper clutch is a desirable feature for newbies and aggressive pros. Riders who are especially tall or particularly heavy might feel cramped or wish for a stiffer suspension, but that’s not unusual for any motorcycle in this class. 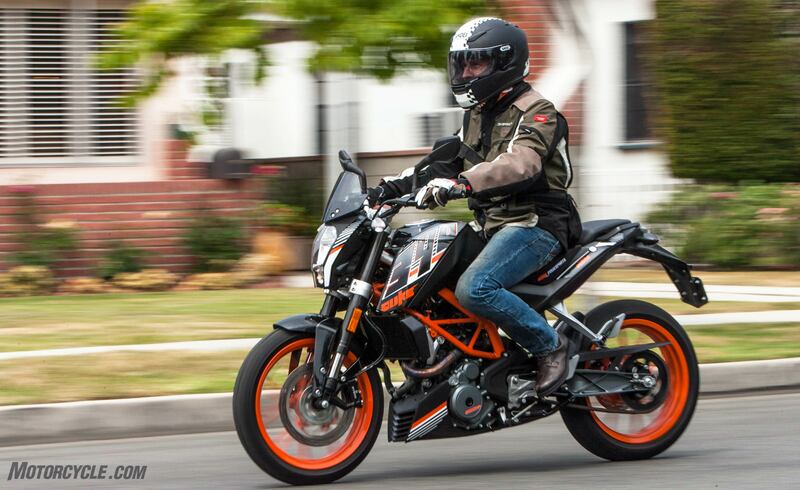 Overall, the 390 Duke looks and performs like a more expensive bike, and it’s hard to imagine a better junior-level sporty bike for riding of all types. Its smiles-per-gallon and grins-per-dollar metrics are off the charts, and its combination of value, style, equipment and fun factor is impossible to beat. 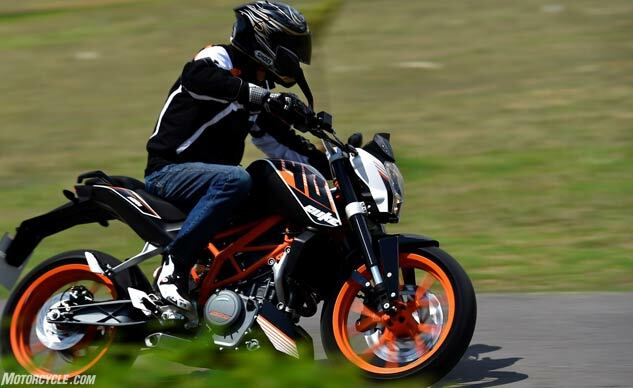 Yep, you can do it all on KTM’s smallest Duke.